Abby's Light has Brightened our Lives! A few months ago, I posted in a local Facebook group. My fiance, my 7 year old daughter and I were trying to figure out a way to make our yearly Wildwood vacation tradition happen. We are in the middle of a very unfortunate, difficult and frustrating time in our lives. The purpose of my post was to ask for suggestions for cheap places to stay, or even us doing housework, babysitting, petsitting, etc. in exchange for a discounted rate on somewhere to stay. Mike, who I later found out is very rarely on that page, somehow came across my post and asked me to message him. What happened next is nothing short of a miracle. He told me about Abby's Light, this wonderful and beautiful organization that was created in loving memory of his beautiful daughter. We started chatting and briefly getting to know one another. After talking through Facebook, we eventually talked on the phone and then had the pleasure of meeting him and his amazing wife, Meg, in person. Thanks to Mike, Meg and every single person who was or is in any way involved with Abby's Light, we are now able to take our daughter to Wildwood this summer. We had already told her that it most likely wasn't going to happen, but that we'd try to at least stay for a night. She was extremely sad, as it has been a tradition since she was born that we go to Wildwood every summer for a vacation. When we met Mike and Meg in person, our daughter received a gift from them, two packs of Season 4 Shopkins. She was so happy. We waited until after dinner to tell her that we would, thanks to Abby's Light, be taking her to Wildwood this summer for a week. I will never forget the look on her face. It brought so much joy to her that it brought tears to my eyes. Most importantly, Mike, Meg and Abby's Light has made all three of us look at things from a much different (and much better) perspective. Our current situation is dire at best, but now we try to focus more on the positive than the negative. We cherish every moment a little more. Not a single day goes by where I don't think about Abby's Light and everyone involved. On top of this extremely generous gesture and gift, we became the first family that Abby's Light has adopted. They had been considering launching a new addition to the foundation, called Abby's Adopted Families, and it is now up and running. I will never be able to find the words to thank Mike, Meg and all of you for everything that they have done and will be continuing to do for us. We are so overwhelmingly grateful and appreciative that a seemingly coincidental Facebook post turned into such a blessing. This foundation has restored hope, faith and happiness that was missing from our family. Thankfully, our situation is temporary. At some point, most likely (and hopefully) in the relatively near future, we will be taking steps towards getting ourselves stabilized. Once we are back on our feet, we will most certainly be contributing to this foundation. I am so incredibly thankful that we have had the pleasure of meeting Mike and Meg. Although we never had the pleasure of meeting Abby face-to-face, all three of us carry her with us in our hearts on a daily basis. During a time when things seemed so dark and so hopeless, Abby's Light truly did bring light into our lives. May God bless you all, and may Abby continue to live on in spirit forever. We will most certainly make sure to spread the word about this foundation and give back in any way that we can. 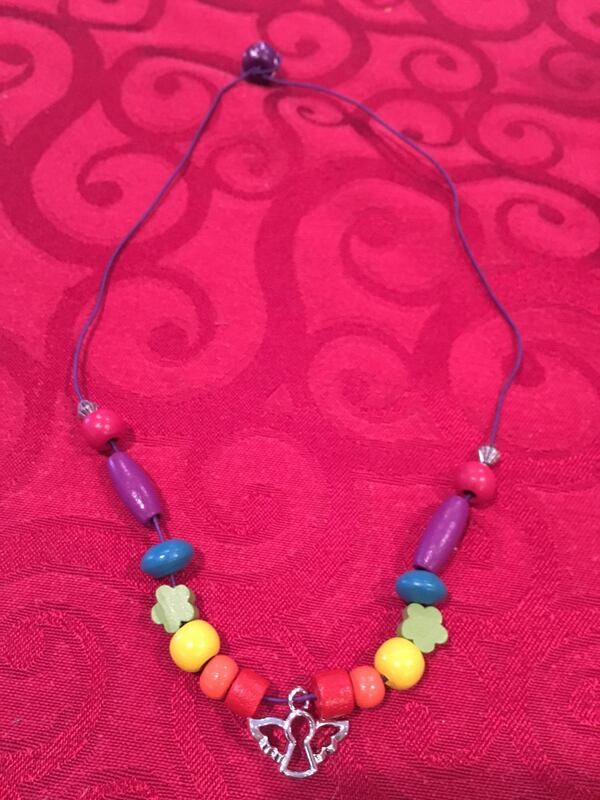 to get the beanie boo as well as the necklace kit. She loves both. Thanks again for all that you do. A gift from a precious child. Making jewelry with her gift from you today. Thank you so much for making her day & lifting her spirits! Kati, I'm thrilled to say that, while a hospital is in no way a place to enjoy your birthday, our little girl is truly making the best! There are certainly MANY smiles in this room this afternoon! Thank you so much for your kindness! I can only imagine, Mike, what light Abby brought to this world while she was here. But know that you brought light to us yesterday in her name. We were struggling to keep our son's spirits up yesterday in the hospital. 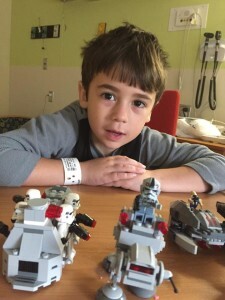 He missed home, and had spent more time in the hospital than we ever wanted for him. Your visit and delivery of his Lego Star Wars sets changed his outlook immediately. He's been building and playing ever since. He's happy -- and that means the world to us. Know that you are making a difference. We thank you from the bottom of our hearts. 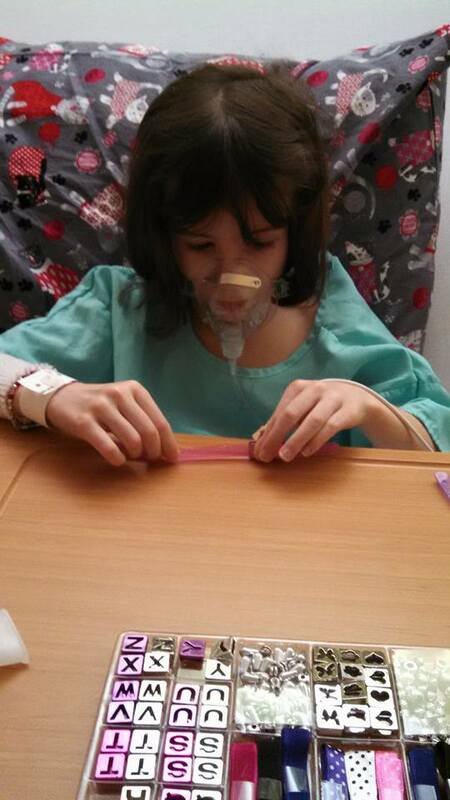 Dear Abby's Light: Last week my daughter spent a few weeks at Doylestown Hospital with Pneumonia. The puzzles that you brought lit up her day and kept us busy during our stay at Doylestown as well as The Children's Hospital of Philadelphia where we were eventually sent. 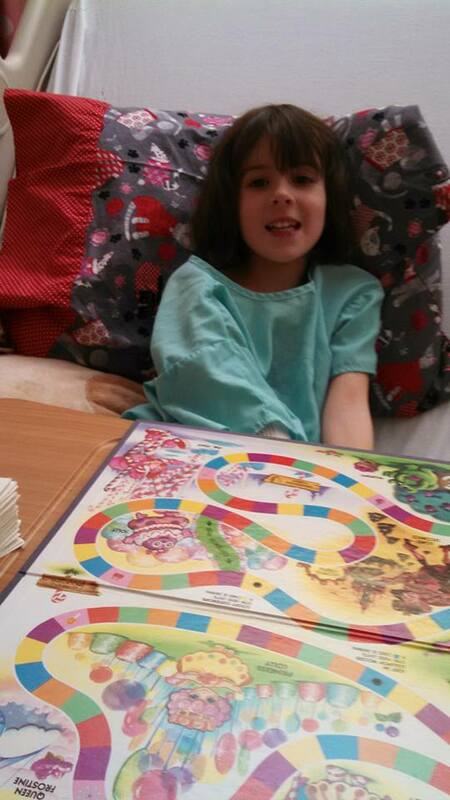 She is home now, back to health, after 8 days in the hospital but we still do the puzzles everyday after dinner. She loves them! And the fact that you returned the next day, to bring her twin sister a Princess Barbie, like G received, was beyond generous. You are doing wonderful work in memory of your daughter. I'm sure she is smiling down and proud of you from her home high above. May God's love help lessen your grief. "Beanie Boos to the Rescue!" 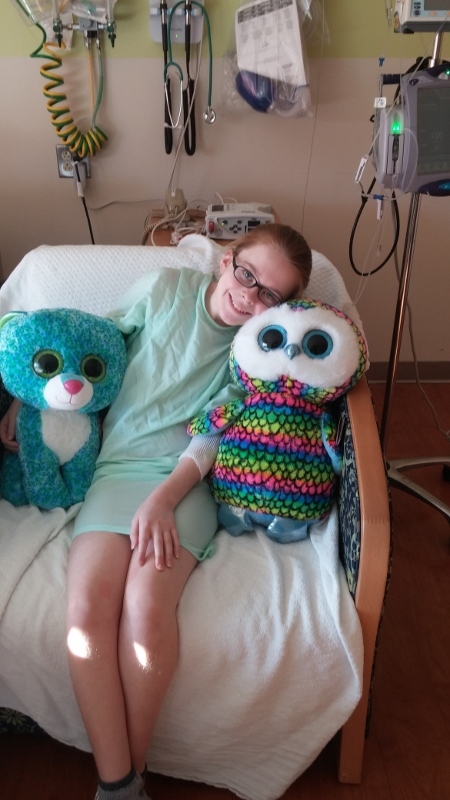 Mike and Meg, Words cannot begin to express how much we appreciate Abby's Light Foundation's thoughtful and generous gift to our daughter, Hannah, while she was in Doylestown Hospital. Your visit to her in the Pediatric Unit made her day! Those Beanie Boos lit her face with the brightest smile we had seen in a week! Hannah is home now and feeling much better. 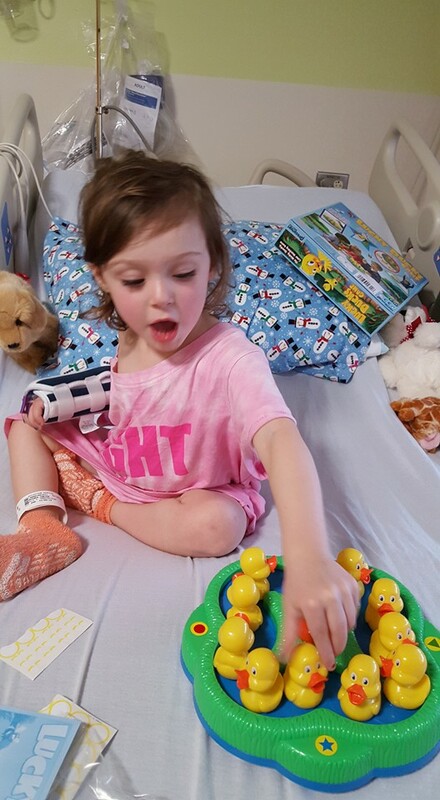 We can't imagine what you have been through, but your efforts to bring smiles to hospitalized children is wonderful. Mission accomplished! God Bless You! Today I saw an older, mentally slower lady at Wawa. She didn't know how to order food. I helped her and then paid for her meal. I hope I would have done this anyway, but Abby did make me more cognizant of AOK. Also, last week I helped buy books for children at my kid's book fair. It feels weird posting since I didn't do either for praise but I wanted you to know I was thinking of Abby.